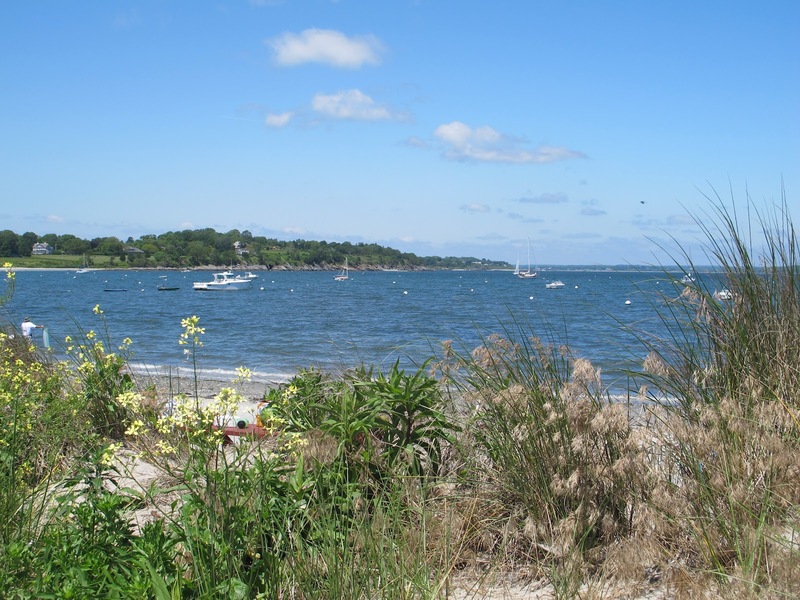 Our weekend in Newport was perfect even though it went by in the blink of an eye. Saturday night we had a cookout for Mrs. K's birthday and then went out to some bars. I decided this chambray polka dots button down needed to come out with me. It's the softest and most comfy shirt you'll ever own. Seriously. Shirt: J.Crew, Jeans: GAP, Bag: J.Crew (on sale in stores), Shoes: Steve Madden (old), Necklace: Jessie James, Bracelets: Eleven11 c/o, vintage, Soria Z. Jewelry c/o. Viv- you look so chic! I love the preppy button up with white jeans. Gorgeous as usual! Oh wow so so pretty Viv! I love this look! I think you've convinced me to buy that top!!! I love it:) Such a classic. Love perfect weekends. And I already have a love affair with chambray, I think I need one with little polka dots. you look great! Fun twist on a classic shirt! 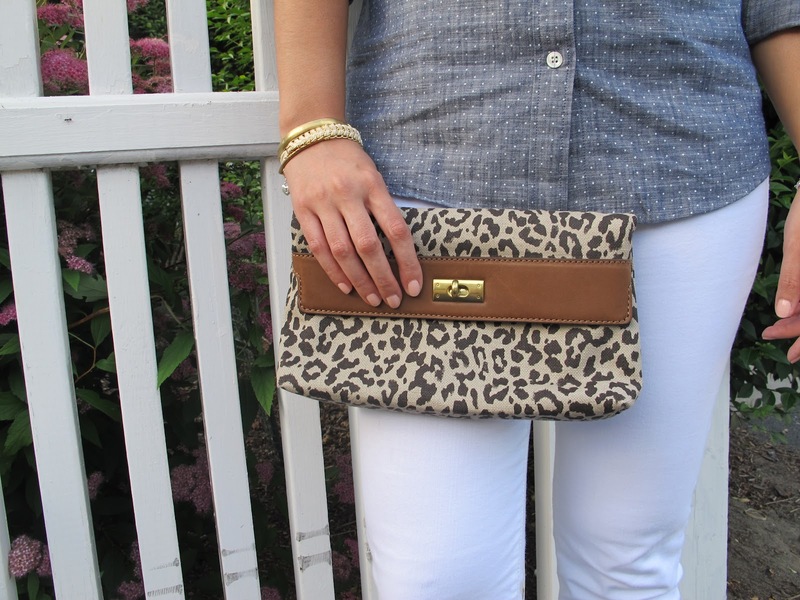 Love how you paired it with a leopard print purse! ummmm that shirt is too darn cute! Love that top! Looks fab on you! I spent my weekend celebrating my sissy's birthday with family and friends.. was so fun! Love a good celebration! Love the leopard clutch, Viv! I saw that shirt in the J.Crew Style Guide and fell in love with it. It looks awesome paired with the leopard clutch! Cute!! I love your chambray polka dot shirt! Need!! Gorgeous! I love your shirt! so cute! and love the clutch! viv you look so pretty!!! your outfit posts just keep getting better and better. 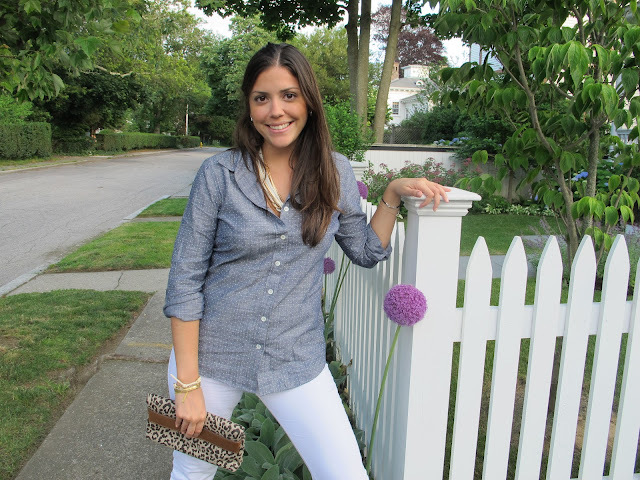 that chambray polka dot shirt is seriously great! You look absolutely adorable! Love pairing patterns like you did! fabulous! such a gorgeous look! beautiful! Love it, I just got the same shirt yesterday! It's adorable!! U're such a sweetie here! :) Lovely blog and style! 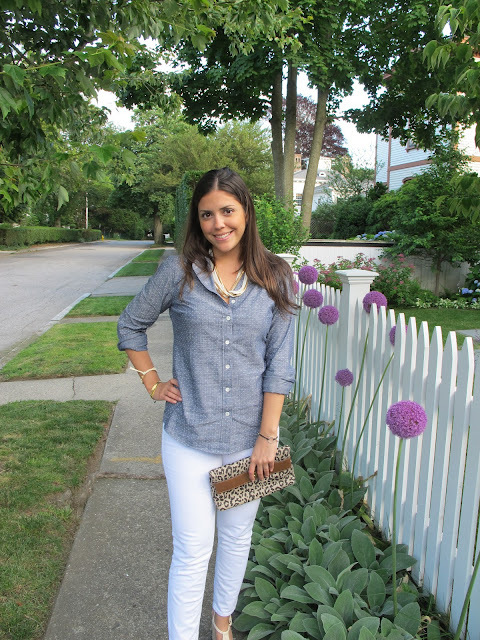 Love the chambray dots! The whole look is really fresh and summery! Polka dot chambray, I'm in love! Such a classic look.